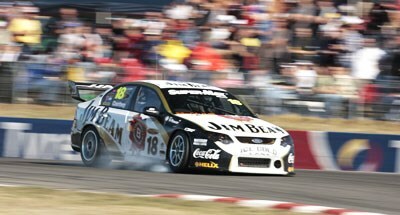 There was plenty of overtaking at Winton but was it proper racing? While spectators and TV viewers were confused by the strange spectacle of some of the hero drivers being passed by lesser lights at Winton last weekend, one V8 supercar driver has come out strongly in favour of using the new soft compound tyres in more championship races this year. "The soft tyres are fun to drive on because of extra grip, plus they create more passing which increases the excitement for fans at the track and those watching the Channel Seven telecasts," said the Jim Beam Racing Falcon racer. "I think championship officials could now consider more races on the soft tyres, especially at some street circuits because they are usually narrow and passing is difficult." "We are competing with other sports for entertainment dollars - the public want to see exciting racing and cars passing each other so let's give it to them." "Formula One also has a soft tyre now because they, like us, want make their show better." The soft-compound optional Dunlop V8 Sport Maxx 'sprint' tyres were used for the first time in the third event of this year's championship at Winton in Victoria from May 1-3. Every driver was obliged to use the softer tyres at least once during the two-race weekend. For the remainder of the races, the cars were fitted with durable Dunlop 'control' tyres previously used exclusively in the championship. The introduction of the soft Dunlop creates a whole new set of strategies for the teams. The soft sprint tyres are more than 2secs a lap faster than the regulation harder control tyre issued to teams. But they degrade way faster than the hard Dunlops, which are more consistent over a whole race. The 'sprint' tyres are also scheduled for use in five further events this year; at Symmons Plains in Tasmania, Darwin's Hidden Valley, Sandown in Melbourne, Queensland Raceway near Ipswich, and Perth's Barbagallo Raceway. Courtney, who has finished on the Bathurst 1000 podium the past three years, said the mixture of tyres at Winton promoted passing. "In the past I've heard criticism our racing is sometimes too processional, but there was plenty of passing at Winton with cars circulating on different tyres," said the 28-year-old Gold Coast-based driver. He would like to see the V8 supercar category expand the use of the softies to other venues, "especially street circuits". Last weekend, Courtney used his set of 'sprint' tyres in the first race at Winton, and his best lap around the 3km circuit was 2.729-seconds faster than his quickest lap in race two driving exclusively on 'control' tyres. "On the soft tyres you can brake earlier for corners and accelerate quicker on the exit," he said. "You have more confidence with grip to make a pass, but on the 'control' tyre you have to coax the car." He suggests the teams are still learning how to implement the best strategies for the mix of tyres. "You also use more fuel on the soft tyres, so in some instances it might be better to drive below 'ten tenths'. If you conserve fuel you might also retain the extra grip for more laps." Courtney said one criticism he had heard from fans and television viewers about the 'sprint' tyres at Winton was regarding the identification of cars using the soft-compound option rubber. "They had yellow markings on the soft tyres, but maybe these need to be bigger - I'm sure it's fixable," he said. But spectators and TV viewers have indicated that they were quite unsure about how to interpret unusual scenarios unfolding during the two races at Winton. Despite the unpredictable dénouements, when the chequered flag was shown in both races, the same team - Triple Eight Race Engineering - was the victor. Triple Eight is selling its awesome 525kW shaggin’ wagon race car. Still, their loss is your gain.